Bred to resemble a miniature tiger, the Toyger (an amalgam of “toy” and “tiger”) is a relatively new cat breed and still quite rare. The Toyger is a wild-looking cat with a domestic personality. Rather than having regular tabby patterns, it has branched or broken stripes and stretched rosettes that form random patterns, similar to those of a tiger. Large-boned and muscular, the Toyger is an athletic cat. Males weight 10-15 pounds and females 7-10 when full-grown. The Toyger’s dark stripes provide a dramatic contrast to its gold or orange-brown background, and each Toyger has its own signature pattern. 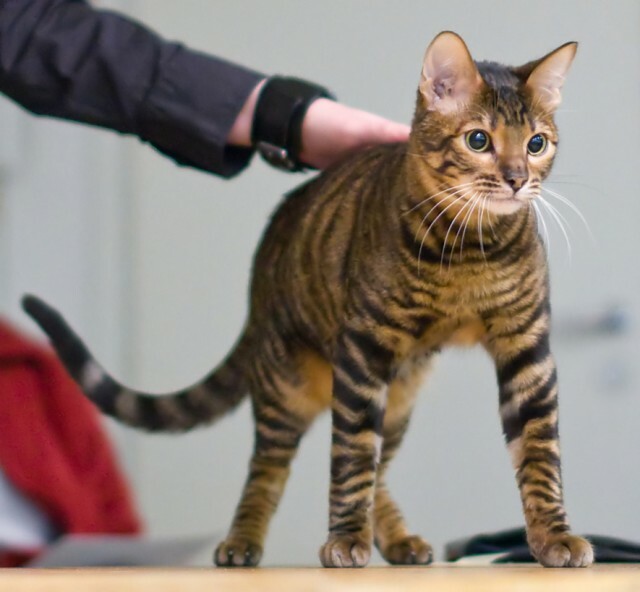 Ideally, a Toyger will have a hint of gold glitter (gold-tipped hairs) in its coat. Typical Toygers have heart-shaped faces, broad noses, strong chins, and long rectangular bodies. Those most closely matching the breed standard have relatively small rounded ears, plump whisker pads, light bellies, and long thick tails. Because the breed is still in the developmental stage, the appearance of individual Toygers is quite variable. Toyger kittens tend to go through an ugly duckling phase between 6 and 10 weeks when their fur is grayish with little contrast or ticking. It usually takes about 8 months for a Toyger’s markings to evolve into their beautifully defined adult patterns. The Toyger breed was developed in the 1980s by Judy Sugden (daughter of Jean Mill, who created the Bengal cat breed). For her initial breeding program, Sugden used a tabby named Millwood Sharp Shooter that had unusual spotted markings on his head. Additional cats that were key to developing the breed included Scrapmetal, a domestic shorthaired tabby, and Millwood Rumpled Spotskin, a large Bengal. Jammu Blu, a Kashmiri street cat, was also imported and added to the Toyger mix because he had distinctive spots between his ears. 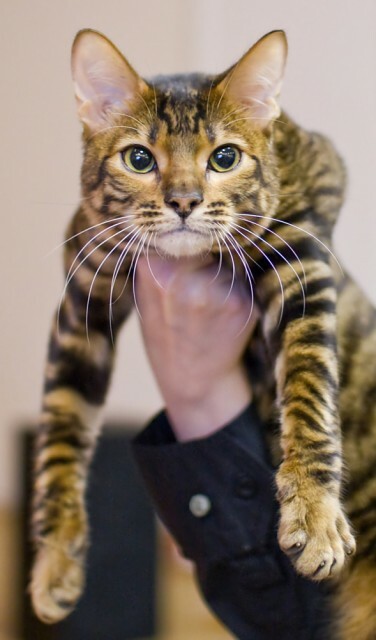 Toyger breeders now use computer imaging to get a sense of what the progeny of various pairings might look like, sharing photos with other breeders online and arranging matings. The breed is still in development, with breeders working to increase the resemblance of Toyger markings and facial features to those of real tigers. Thus far only The International Cat Association (TICA) has recognized the breed, granting the Toyger championship status in February 2007. One of Sugden’s goals in developing the Toyger breed was to increase awareness of the need for tiger conservation. To this end, she donates a portion of the money raised through the sale of Toyger kittens to tiger conservation initiatives. Although many people have mistakenly assumed that Toygers contain tiger genes, no tigers were used to create the Toyger. However, Toygers do have a wild cat heritage because Bengals, which are wild-cat hybrids, were used in the breeding program. The Toyger is among the more doglike cat breeds. Intelligent, trainable, and active, many adapt well to leash walking and enjoy playing fetch. There are only about 50 breeders of Toygers worldwide, so these cats are still quite rare. However, the breed is gaining popularity, with an increasing number of breeders taking an interest. Although pet-quality Toygers are not suitable for showing, they still have the appealing Toyger personality. Broad, M., Pictures of Cats. (n.d.). “Toyger.” Pictures-of-Cats.org. Garrett, S.J., Roman Toygers. (2008). “FAQ of Toygers.” RomanToygers.org. The International Cat Association. (n.d.). “Toyger.” TICA.org. Toyger Cat Society (2006). “About Toygers” and “Pets.” Toygers.org.